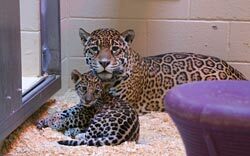 The Milwaukee County Zoo’s new jaguar cubs are now on public display in the Florence Mila Borchert Big Cat Country. The two male jaguar cubs were born November 13 to mother Stella, and father, Pat. 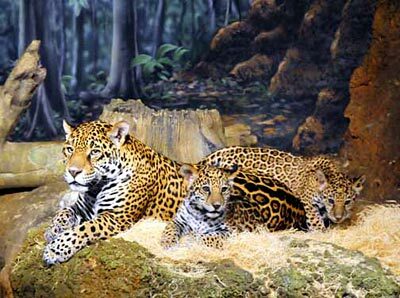 The last time the Zoo displayed jaguar cubs was 1975. The cubs are the first offspring for Stella, 9, and Pat, 14. Because Pat is a rescued, wild-born animal from Belize, Central America, he is considered a founder to the population, and his cubs bring valuable new genes to North American zoo population. The cubs received their first veterinary exams and vaccinations in early January, at approximately seven weeks of age. Zoo vet staff report they are in good health, and weighed in at approximately 8.5 and 9.4 pounds. Prior to the public unveiling, visitors have only seen Stella and the cubs through a live webcam of their dens in the Florence Mila Borchert Big Cat Country. The public can now see the cubs daily from 10:30 a.m. to 1 p.m. These hours will be extended as the cubs become more comfortable on exhibit. Thank you to everyone who has helped the cubs grow and develop through enrichment items. Watch the video below to see some of these items in action. There is never a dull moment in Big Cat Country with these new cubs! The names for the cubs were announced on their 4 month birthday. The cubs that the keepers have been referring to as "Big," has now been named B' alam which is a Mayan word for jaguar. It means "great and powerful king." This name was chosen by the Zoo's public naming contest. The second cub, which the keepers were referring to as "Little," was named Zean (zee-ahn), which is a name chosen by the schoolchildren of Belize. It comes from the last few letters of BeliZEAN. The name Zean was chosen to encompass all of the people of Belize, and supports their natural heritage and culture. The cubs' father, Pat, is from Belize and the people of Belize are still very connected to him, and now his cubs. The cubs continue to grow quickly, and are already more than 30 pounds. B' alam is at 32 pounds and Zean is close behind at 30 pounds! They are enjoying time on exhibit and also having more space to run and play! The jaguars also enjoy watching "The Cheetah Show" which is a video that plays on the big screen in the building. The keepers have a portable DVD player, and they run movies for the jaguar cubs. They seem to like animated and action movies the best; they really just like to watch the movement and hear the sounds.